Tiger Woods and Bobby Jones top one of the most impressive lists in golf--the list of all-time USGA champions. Their place at the top should be safe for quite some time, but there are chasers out there. Two of the three players that have the best chance of catching them are women. The first is Ellen Port, the 56-year-old head women's golf coach at Washington University in St. Louis, who won her 7th USGA championship at last year's U.S. Senior Amateur. The second is Nathan Smith, the 39-year-old from Pittsburgh whose win in the 2015 U.S. Amateur Four-Ball was his 5th USGA championship. The third is another 39-year-old, and is the subject of this interview. 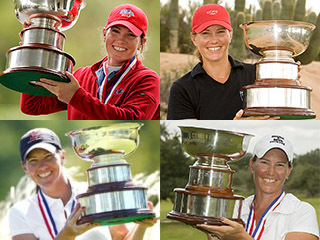 Meghan Stasi is a four-time winner of the U.S. Women's Mid-Amateur (2006, 2007, 2010, 2012). She has made match play in all 12 of her starts in the event, and has compiled a 45-8 match play record. She and her partner Dawn Woodard, winners of the Women's International Four-Ball, have made match play in all three of the U.S. Women's Four-Ball championships that have been contested. And she will be eligible for senior golf at age 50, five years earlier than the cutoff age for men. So there should be plenty of chances for Stasi to chase the all-time USGA greats. Stasi might not have been on the list at all had she stuck to her original plan. Meghan Bolger (as she was known then) was a three-time All Conference USA selection at Tulane University. After graduating in 2000, Bolger went to the University of Mississippi to get her Master's degree with the idea that she would play professionally after earning her degree. Everything that has happened since is what Stasi calls "Plan B". Plan B involved becoming the head coach at Ole Miss at the age of 23 and leading the Rebels program for 7 years. Then came the back-to-back U.S. Women's Mid-Amateur championships in 2006-2007 which made her just the 3rd repeat winner in the history of the championship. There was the January day in 2008 when she found out she had made the Curtis Cup team on the same day that she met her future husband, Florida restaurant owner Danny Stasi, while competing in the Jones/Doherty Women's Amateur at his home course of Coral Ridge CC in Fort Lauderdale. And then came the Curtis Cup victory at St. Andrews later that year, teaming with players like Stacy Lewis, and getting engaged on the Swilcan Bridge. More than anything, Plan B has meant winning golf tournaments. In addition to the 4 USGA championships, there are the seven straight Philadelphia Amateurs (she grew up in South Jersey just across the river from Philly), the four International Four-Ball wins, the Harder Hall and Jones/Doherty wins (the latest just last week), the numerous Florida State Golf Association (FSGA) titles including the state am twice and the state mid-am four times, and the seven FSGA Player-of-the-Year awards. It has also meant representing Florida in the U.S. Women's State Team, the USA in tournaments like the South American Amateur, and herself in multiple U.S. Women's Opens and countless other tournaments around the country and around the globe. Off the course, the Stasis own and operate the Shuck 'n Dive, a Cajun restaurant that takes Meghan back to her college days in New Orleans, and where she is the floor manager. Age when you competed in your first tournament: 8. I remember my grandfather caddying the 6 holes for me. I won a $5 gift certificate and bought a sleeve of pink Flying Ladies. Your early golf hero(es): Juli Inkster, Betsy King, Jan Stephenson. I grew up attending the LPGA ShopRite at Greate Bay Country Club. Number of countries you have competed in: 11: USA, Australia, Scotland, England, Ireland, Peru, Argentina, Finland, Austria, Canada, and France. I've also played in Hong Kong, Singapore, Russia, Colombia, Mexico, Dominican Republic, and Dubai. Editor's note for the non-historians: Margaret and Harriot Curtis were among the earliest women to put their stamp on the game in America, with Margaret playing in the 1897 U.S. Women's Amateur as a 13-year-old. Both were Women's Amateur champions (they played each other in the 1907 final) and were responsible for the creation of the biennial Curtis Cup Matches between the USA and GB&I in 1932. Serious, competitive, respectful, conservative, even-keeled, traditional. When was the earliest time that you realized that you were capable of achieving great things as a competitive golfer? I finally learned how to score as a junior at Tulane University. My freshman and sophomore years, I would lay up with the wrong club and end up in the wrong place, then 3 putt. When, I changed my thought process on course, my scores began to lower. If I had a poor range warm-up or start I wouldn’t put pressure on myself. I started making more birdies and having fun with each round. It takes six match wins in a row to win an amateur USGA championship, and you’ve done it four times. Since it is so rare for someone to have her best game for six straight rounds, how do you go about winning matches at those times when you are not at your best? I have never won a U.S. Mid-Am with six of my best rounds. Each win came with a few hard fought matches against incredible competitors. I've learned over the years that anything can happen in match play. I never give up and always fight to the end. You have to make adjustments in the round and trust in yourself and your game. I've always wanted to be well balanced in all aspects of my life. I try and live up to my friends' and family's supportiveness. I love working at my husband's restaurant Shuck 'n Dive. I surround myself with healthy positive relationships at work, in golf, and family. On a positive note, golf's international growth is outstanding. One negative is that traditions are being lost. I witness disrespect among players and the game all the time. I feel players of all ages should be held more accountable. I've learned more from losing than winning. You have to know how to handle yourself on and off the golf course. Amateur golf needs to continue growing the game but not forget its roots. What were your favorite, and least favorite, parts of being a college golf coach? I loved coaching at Ole Miss in the SEC conference. I experienced the Southern hospitality everywhere we traveled. I formed unbelievable lifelong friendships. My least favorite part was leaving! My brother moved down from New Jersey in 2001, married an Oxford [Mississippi] woman, has two kids and still lives in Oxford. It was difficult at times to earn respect as a young coach but I wanted only the best for all players on and off the golf course. I would have changed a few approaches but I really did enjoy working as a college coach. You live in South Florida but grew up in the Greater Philadelphia area—two very different areas but both hotbeds for golf. How would you compare the “golf culture” between South Florida and Greater Philadelphia? The golf culture in Florida and Philadelphia is very similar because they are both highly competitive in a densely populated area. Both have so many great golf courses, players, and are managed very well. I am very appreciative of the Women's Golf Association of Philadelphia in my early stages and the continued support. I play every chance I can at Tavistock Country Club in Haddonfield, New Jersey. The Florida Golf Association is model association for the entire country. Both amaze me with their leadership and growing the game. Women’s participation has risen steadily over the years in all USGA events except for the Women's Mid-Amateur, suggesting that there may be unique challenges for women mid-amateur participation in competitive golf. What are your views on this and what are some ideas you might have for growing the women’s mid-amateur game? Women mid-amateurs do face different challenges—they start careers, families, and put golf on hold. I believe most do not get their amateur status back because they are exhausted and don’t find the joy in playing anymore. Women mid-ams do not have a lot of tournaments to choose from so we find ourselves playing in tournaments against young kids. But even though the numbers are lower, the field quality has gotten a little stronger. Since the USGA announced that the winner of the Women's Mid-Am is now exempt to the U.S. Women's Open, we are growing in the right direction. I look forward to seeing what else is in store—SIGN ME UP, I'll be there!